Chinese rights lawyer Xie Yang has been released on bail after recanting accusations of police torture during his trial on Monday. But he is still under tight surveillance by secret police, according to his wife. A court in the central Chinese city of Changsha has yet to announce a verdict, and legal experts say a ruling may not come any time soon. Rights groups suspect that Xie’s swift release is likely a trade-off and another way of controlling rights advocates without having to put them in formal detention, a tactic that will make it harder for the international community to keep the pressure on. Xie’s wife, Chen Guiqiu, has fled China and is now in the United States with her two daughters. “Escorted by secret police, Xie Yang arrived home on May 9 to celebrate his mother’s 80th birthday. But hours later was taken away along with his [octogenarian] parents to a residence in a remote village deep into the mountains. He still has no genuine freedom,” Chen told VOA. Chen says that when she spoke with Xie on Wednesday, her husband sounded indifferent when she shared details of the intimidation and harassment suffered by their family while in China and recounted their escape in March to the United States. She said she thinks it was inconvenient for Xie to speak freely, but also noted that his responses were strange and abnormal. Chen said her husband demanded she and their daughters return to China from the United States, promising that Chinese authorities would keep the family safe. Despite this, Chen said their daughters were overjoyed to learn of their father’s release. “They are thrilled, in particular, my eldest daughter burst into tears after learning of his release. [They] miss their father very much. It’s been almost two years since they last saw their father, who was arrested without any warning,” Chen said, adding that she holds little hope that Xie will one day be allowed to visit them in the U.S. The family’s lawyer, Chen Jiangang, who was denied access to Monday’s trial, believes Xie’s release is part of a trade-off. He insisted what he disclosed in January about Xie’s torture by Hunan police was based on Xie’s own words during their meetings, even though his client denied the allegations in court. Now that Xie has successfully been silenced, Chen said authorities are working to shut him up as well. Chen’s family was briefly detained in the southern province of Yunnan last week. “Xie Yang lied and denied being tortured. That helped the Chinese government save face and, in return, the Chinese government would promise to let him keep his license. This is a trade-off,” Chen told VOA. “Why are they after me? They are seeking revenge as I was the one who made public his allegations of torture,” which invited criticism from 11 countries, he added. Frances Eve, a researcher with Chinese Human Rights Defenders, said Xie’s release, likely in exchange for his guilty plea, was the government’s latest show trial to incriminate rights defenders. “It’s a way to control people without having them in formal detention, which is harder for international advocacy efforts to keep the pressure on because it’s harder to know what is exactly happening to them when they’re kind of just being controlled in house arrest [or] surveillance,” Eve said. FILE - This image made from Aug. 1, 2016 video shows Chen Guiqiu, left, has lunch with lawyer Jiang Tianyong after attending a trial for human rights lawyer and activists at the Tianjin No. 2 Intermediate People's Court in Tianjin, China. But such tactics are unlikely to silence the larger debate and widespread concerns about a nationwide crackdown on rights lawyers that began on July 9, 2015. 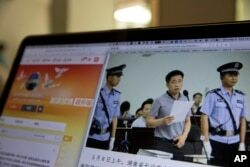 More than 300 lawyers have been caught up in the crackdown, which is aimed at those assisting dissidents and government critics. Most of those lawyers have been released, but 32 have been indicted and seven others are awaiting trial. On Friday, Wang Qiaoling, the wife of prominent rights lawyer Li Heping, and other supporters filed a suit with the Supreme Court demanding an investigation into the police’s torture of Li as well as information surrounding the disappearance of another lawyer, Wang Quanzhang. After a 669-day detention, Li returned home earlier this week after being convicted of state subversion late last month and sentenced to three years in prison with a four-year reprieve. Li’s wife insists he suffered cruel torture and urged authorities to get to the bottom of the alleged abuse of power. Meanwhile, the Washington D.C.-based Congressional-Executive Commission on China has expressed alarm about what it called China’s continued assault against rights lawyers. “If China persists in viewing its own citizens with suspicion and hostility and if it continues to ruthlessly disregard their most basic rights, it will never be viewed as a responsible global stakeholder,” the commission said in a statement. “The international community needs to acknowledge that Xi Jinping’s increasingly severe suppression of internationally-recognized civil and political right has real implications for regional stability and bilateral cooperation,” it added.